For the longest time I have shrugged off KDE 4 because of poor performance. But since 4.4 I have noticed a rather vast leap of the improvement chasm. Now, 4.5 is out and the leap went lunar! That's right, KDE has finally reached a level of usability and performance that rivals any of its competition (so long as its competition isn't one of the very light weight window managers, but that's comparing apples to chocolate chip cookies). For all of those who want to experience this amazing improvement, but don't want to have to wait until your distribution of choice releases with KDE 4.5 in all its glory, fear not...there is a way. In this article I am going to show you how to upgrade both Fedora and Ubuntu so that your KDE becomes as snappy and reliable as it was back in the good ol' days of 3.5. You will want to make sure that your distribution is fully up to date. So use either your Update Manager or run an update from the command line. Once you have done this you are ready to go. As I said, I am going to be showing you how to do this in both Fedora and Ubuntu. This means we'll be dealing with apt and yum repositories. The first thing you have to do, in order to make your package manager aware of the new KDE updates, is to edit your repositories. Let's first do this in Fedora. With the repositories in place you are almost ready to begin. But first you have an extra step in Fedora. In Fedora you need to fist make sure you have the repositories enabled before the system will be aware there is an update. To do this click on the start button and then enter "kpackage" in the search string. KPackageKit will pop up. Click on that entry to start up the tool you need. Within this tool you will want to click on the Settings "tab" (see Figure 1) and then scroll down until you see KDE Testing and KDE Unstable. Check both of those and click Apply. Once you have done that you are ready to check for updates. To do this click on the Software Updates "tab". You should see numerous updates available, all pertaining to KDE 4.5. You are ready to update. You are already in the location you need to be in for Fedora. 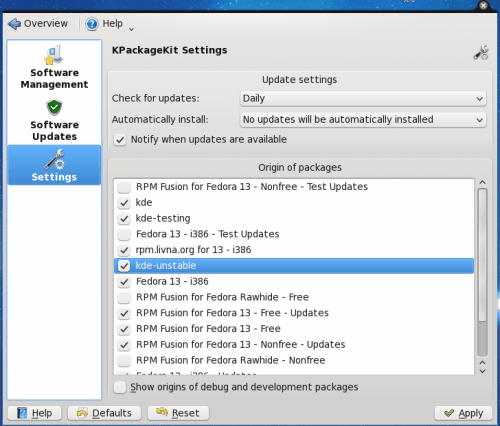 Click the Select All Updates button in KPackageKit and then click Apply. The update process should now begin. Once your upgrade (or install) is complete all you need to do is log out and log back in. You can open up the Dolphin file manager and click Help > About KDE to see that, in fact, you are now running KDE 4.5. Enjoy the experience! So it is finally up to KDE 3.0 speed and usability. I waiting for KDE 5.. The curse of version 4 (beware)..
Read your history. DOS 4 and all version sucked. The massive difference between adding repositories is only one of the reason why ubuntu is more popular. Honestly, if KDE is what floats your boat there couldn’t be a worse distro than Ubuntu to choose. KDE is regarded at a best as second thought at Ubuntu, to put it mildly. I have not used RH-derived distros in a while but still have fond memories of the experience provided by the KDE-RedHat team back at a time when neither RedHat itself nor Fedora could give a crap about KDE. And I heard that they still produce a decent KDE install to this day so it is probably better between the two covered in the article. There are of course better distros out there that take the time to package KDE properly such as OpenSUSE and Mandriva and some that arguably do an even better job such as lesser known distros PCLinuxOS and Pardus. If you like KDE, then stay away from Ubuntu. Too late – after years of happiness with KDE 3.5 and months of frustration with the unnecessary “paradigm shifts” for 4.X and being forced by distributions to move from 3.5, I’ve moved form Mandriva/KDE to Ubuntu/GNOME – superb!!! Should have done it years ago. I wasn’t one who complained about earlier releases of KDE 4.x. But I am off it completely now, because KMail has become so buggy and unreliable in the last two releases. First, it would fail to connect to Akonadi, leaving the address book inaccessible. Now, it crashes before I can do anything, due to some bug in the IMAP handling. I have two IMAP accounts set up and I can’t fix either one. When you ask the developers about this, they know the problems but aren’t fixing them right now. This seems to be due to resource constraints. Good answer, I guess. But I’m not going to use KDE if one of its key applications is broken. So, Gnome it is! Not a smart choice I would say. I used Gnome for many years before I switched to KDE 4.3 last year. And I am happy with it. It is a really fine and modern desktop system. Its better than Gnome, in my opinion. Let’s hope it’s finally decent this time. If I find some time to play with it, I’ll probably download and compile the source myself for 4.5, since I run Slackware. The KDE 4.x desktop truly sucked (for actual usability) compared to anything from 3.0 on, especially 3.5. For example, has the kprinter deficiency in 4.5 finally been fixed? I need some way to get “GNOME apps” like GQView, Evolution, etc. to use the KDE printing subsystem, to keep from driving end-users nuts w/ two printing control subsystems (GNOME’s and KDE’s). KDE 3.x provided me with that, with kprinter. Yes, this kind of detail matters a lot to end users who just want to get work done and aren’t desktop code hackers. After the debacle that has been KDE 4, I find I’m a bit reluctant to trust the KDE dev team again. I haven’t bothered with a KDE version since 4.3. But if this KDE 4.5 is actually any good, maybe I can once again recommend it. I’d really like to be able to recommend KDE again.